As a member of the Bodog group of companies, Ignition Casino is backed by this organization’s long-time reputation for fair gameplay and quick payouts. The poker network is one of the largest anonymous networks online. It offers fast-fold Zone Poker – a format that makes playing poker even faster. You can download the poker software and play on any modern PC or Mac computer. Don’t forget to claim your 100% up to $1,000 poker bonus for a helping hand in your quest to accumulate sizable poker winnings. No matter how skilled you are on the virtual felt, there’s no reason to ignore any free money that poker sites throw your way. Take advantage of the various promotional offerings available at Ignition Poker; otherwise, you’re just tossing money into the fire. You’ll have 30 days from the time of your deposit to earn as much of your bonus as possible. If you deposit an amount that entitles you to a bonus amount that doesn’t fall neatly into the tiers described above, don’t worry. Your final bonus portion will be prorated according to the standard clearing rates described above, and you’ll have to earn the appropriate number of points to receive your final bonus payment. You can trade in your poker points for tournament tickets or casino bonuses at a standard rate of 200 points to the dollar. Certain special deals may be available, which will allow you to achieve a more favorable exchange rate. You can use up to 5,000,000 Poker Points in this manner each month. Whenever you make a royal flush, you’ll be able to get a cash payment equal to 50 times the size of the big blind, up to a maximum of $200. If you take aces full of kings or better to showdown and lose, then you’ll be able to avail yourself of a beat beat bonus of 100 times the big blind up to $1,000. Both of these special cash payouts don’t require any wagering requirements. You can only qualify for these bonuses at Texas Hold’em cash game hands in which three or more players were dealt in. Furthermore, both of your hole cards must be used. For the bad beat bonus, the hand must go to showdown, but this isn’t true for the royal flush bonus. In order to claim either of these bonuses, send an email to poker@ignitioncasino.eu containing the hand number and table number or call 1-855-370-0600. You must do so within 48 hours of the relevant hand taking place. The early years of Bodog, Ignition’s parent company, are riddled with obscurity and controversy. Founder Calvin Ayre was involved in a few online gambling organizations that were caught in the midst of fraud and dishonesty, but it’s unclear what role (if any) he played in these doings. Be that as it may, Bodog emerged on the scene in 2001 as a sportsbook. Whatever the true story behind its sordid beginnings, it has always acted in an aboveboard manner with its players, offering honest contests and paying out winnings in a timely way. In 2004, Bodog launched its poker product and captured significant market share. Early brand ambassadors included Josh Arieh and David Williams, two big-name players who continued to have considerable success at the tables: a fact that redounded to the credit and popularity of the Bodog poker platform. In 2007, Bodog was the target of patent litigation from 1st Technology, which claimed to hold the rights to a “method and system for interactively transmitting multimedia information over a network which requires a reduced bandwidth.” This seems like excessively broad wording, or at least Bodog thought so, and Ayre attempted to mount a strong defense. The initial legal battles went against Bodog, however, and the company eventually settled by paying $49 million to 1st Technology. In 2011, Bodog spun off Bovada.lv to serve the U.S. market while continuing to cater to the rest of the world with Bodog.ca, Bodog.eu and several other brands. Shortly thereafter, Bodog began to experiment with a recreational poker model. This involved anonymizing players at the tables by listing them as “Player 1,” “Player 2,” et cetera and establishing a restriction of only allowing players to take seats at up to four cash game tables at the same time. Another change involved only listing tables with empty seats in the lobby. Despite the reservations and opposition of many professional players, Bodog’s recreational player model proved immensely successful. The site jumped to the top of the rankings of player traffic among networks. In August 2013, Bodog/Bovada instituted Zone Poker: a fast-fold poker variant that allows for quicker action as players can fold their hands and be instantly transported to a new table to receive new cards. Ignition Casino appeared in early 2016 with casino games and poker software provided by Bodog. The renowned sports-betting platform is absent from Ignition’s offerings however. In August 2016, Bovada.lv announced that it was migrating its poker players over to the Ignition brand and would stop offering poker on Sept. 30. Bovada will continue to operate as a casino and sportsbook. The software used by Ignition Poker isn’t really at the forefront of technical sophistication, but it’s stable and easy to use. Software clients are available for both Windows machines and Macs, so you’ll be able to play on either of these operating systems. There’s also an interface available for mobile users. The poker lobby has several categories for you to choose from at the top. The games are divided into Cash Games, Zone Poker, Sit & Go Tournaments and Scheduled Tournaments. There’s also a section of casino games for when you feel like taking a break from poker. Use the handy checkboxes beside these categories to narrow down the options shown by buyin level, betting structure and type of game. There’s Texas Hold’em, Omaha Hi and Omaha Hi-Lo for you to enjoy. A limited selection of play-money games is available in case you want to try out the action without putting your own money at risk. The games will be listed below these selectors, and you can change how they’re organized by clicking on any column of the display. There might be many more games running than are listed – at least for cash games – because Ignition only shows tables where there’s at least one empty seat. You can click on the “SETTINGS” button to the middle-left of the lobby to open a window that will allow you to configure your gameplay experience the way you want it. Here you’ll find four-color deck, animation settings, preferred seating, default buyin and many other possibilities for customizing the features at Ignition Poker to your liking. Upon sitting at a table at Ignition, you’ll immediately notice something that sets it apart from most other sites – no players are identified by name! This is intentional: It’s called anonymized poker and is meant to give newcomers a fighting chance against the more skilled players. Everyone is simply identified by the seat they’re occupying, i.e., Player 1, Player 2, etc. Once you get past this unusual feature, you’ll find a clean and well-presented table layout. There are few extraneous distractions – you’ll find a chatbox, a button to “buy more chips,” the number of the current and previous hands, and not much more. There is a note-taking facility, but all notes expire at the end of the current playing session in keeping with the anonymized poker philosophy. 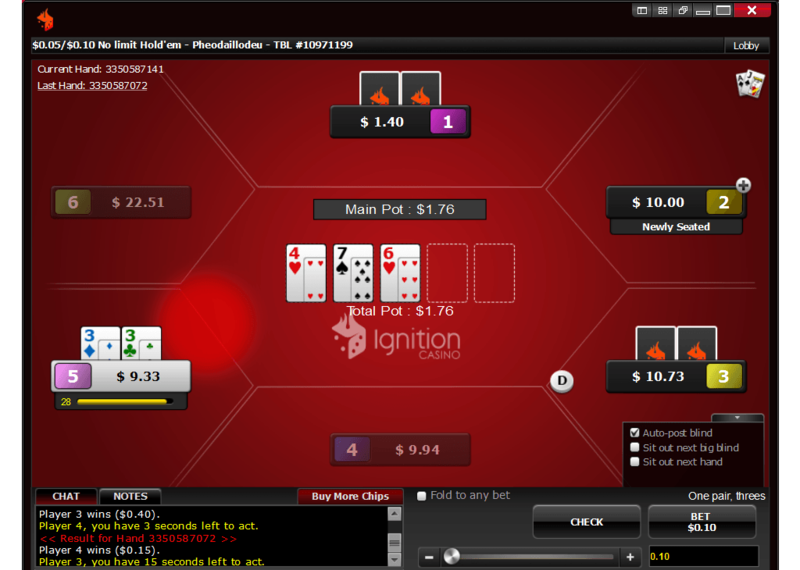 Zone Poker is Ignition’s version of fast-fold poker. Several player pools are available at different stakes, table sizes and games. When you enter a pool, you won’t be playing against the same table of players every hand. Instead, whenever you fold, you’ll be transported right away to a new table to get a new hand. You can therefore play hundreds of hands in an hour rather than the 50 or 60 that you can get in at a normal table. You’ll have to enter some info about the specific hands you’re looking for, and then you’ll see a list of these hands. Choose any hand from the list, and you’ll see the hand history. You’ll be able to replay the hand by clicking on an icon that looks like a circular arrow. So far, so good. Once 24 hours have passed from the time you play a hand, your hand histories will display ALL HOLE CARDS. That’s right, you’ll get to see what all your opponents had in every hand! The reason Ignition Poker can do this is because everyone is anonymized; your knowledge of how a player acts with different holdings won’t compromise future games because you’ll never know when you’re facing that player. This is a fantastic tool for honing your hand-reading abilities and also detecting any collusion or funny business that occurs. Ignition shares its player base with the rest of the Bodog network. While it was once a second-tier operator, Bodog is now the third-largest online poker destination by traffic in the world, and it’s in first place in the U.S. market. It’s tough to get an idea of traffic trends because management doesn’t like to publish figures on the number of people playing at any one time. It seems that Monday is the most popular day for cash games and Sunday for tournaments. No Limit Hold’em cash tables can be found from $0.02/$0.05 through $10/$20, and it’s not uncommon to find games running at both the lowest and highest stakes. Limit Hold’em tables from $0.05/$.10 through $30/$60 are similarly well populated. Remember that the lobby at Ignition only shows tables with an open seat available, so there might actually be more games running than it first appears.Pot Limit Hold’em is also spread at a few tables, but there’s hardly any action. Pot Limit Omaha runs from $0.02/$0.05 to $10/$20, and you’ll probably find a table available at every level, just as with Hold’em. Fixed Limit Omaha runs as well, but with much fewer tables. There’s sporadic Limit Omaha Hi-Low taking place at Ignition from $0.25/$0.50 to $30/$60, and the occasional Pot Limit Omaha Hi-Low game runs from $0.02/$0.05 to $10/$20. Zone Poker is spread from $0.02/$0.05 to $1/$2, but there are typically only a few pools with players in them at any given time. There’s PLO spread at several stakes, and NL Omaha Hi-Lo at the lowest stakes, but good luck finding anyone else to play with. The SNG lineup at Ignition Poker runs from $1 + $0.10 up to $200 + $10. You’ll be able to join a mix of single- and multi-table contests with tables sizes of 2, 3, 5, 6 and 9 players. There are turbos, hyper-turbos and normal sit n’ goes in all three games: Texas Hold’em, Omaha and Omaha/8. Check out the tournament schedule at Ignition for the chance to enter tournaments with buyins from $1 + $0 to $150 + $12. This latter buyin figure represents the amount you’ll have to invest to participate in the big Sunday event at Ignition, the $100,000 guaranteed tourney. The schedule is Hold’em-centric, but there are occasional events in Omaha and Omaha H/L to be found. There are tournament series every few months at Ignition, and they usually consist of dozens of events with varying buyins. If you can’t afford some of the higher-stakes tourneys, then look for satellites, which Ignition tends to host many of. The cashier system at Ignition is sadly lacking. There are only a few methods available for funding your account or requesting a payout. On the other hand, this is compensated for by the speed with which players have reported receiving their money. To make your deposit at Ignition Poker, click on the big “CASHIER” button on the left side of the lobby. Then select “Make a deposit” from your Dashboard. You’ll go to a page that will allow you to choose your deposit method, enter the amount of your transaction and choose from your available bonuses. Click “Deposit” after you’ve finished entering your info. You can make your deposits by credit card, Rapid Transfer, Visa Gift Card and Bitcoin. Unfortunately, Ignition will start charging fees on deposits by credit card starting Oct. 1, 2016. The fees will amount to between 5.9% and 9.9% of the total amount, depending on what type of card you use. Rapid Transfer will attract a flat fee of $12. Only by making your deposit through Bitcoin will you be able to avoid these fees. The withdrawal methods offered are Check by Courier, Rapid Transfer and Bitcoin. Only Bitcoin is free. Check by Courier costs $75 each while Rapid Transfer will set you back $50 every time. However, you’ll get one free withdrawal every month, which will be scaled back to one free withdrawal every four months starting Oct. 1, 2016. In order to protect itself from fraud and other misdeeds, Ignition requires players to go through the account validation process before their payouts will be sent. You’ll have to submit to the company a copy of your credit card, a government-issued photo ID and a credit card verification form. Scan your documents, and then send them over to verification@ignitioncasino.eu. Ignition casino has inherited the long-running (in internet years) Bodog mobile platform. This mobile solution only includes cash games and Zone Poker, without either SNGs or MTTs, but it should work on virtually any modern smartphone or tablet because it’s implemented as a web app rather than a downloadable app. Choose the format you wish to play (Zone or Cash) and the type of game (Texas Hold’em, Omaha Hi or Omaha Hi/Lo). You’ll then see a list of all the available tables or player pools. Each listing will display a number corresponding to the number of players at that table or in that Zone pool. The tables at Ignition Poker mobile are very uncluttered and are laid out so as to maximize the size of the table area. A few settings can be accessed by clicking on icons to the left and right of the table, and there’s a chat box in the bottom-left. When you want to chat, you have to click on it, and a full-screen chat window will pop up. Enter your message, then close the interface to return to the game. When it’s your turn to act, you’ll see a handy slider that allows you to increase or decrease the size of your bet. Unlike many other sites, this slider sits atop the table, is vertically oriented and is quite large. All of these characteristics make it much more convenient that is standard. If you want to type your bet values in manually, simply click on the calculator icon to bring up an interface that looks like, well, a calculator. 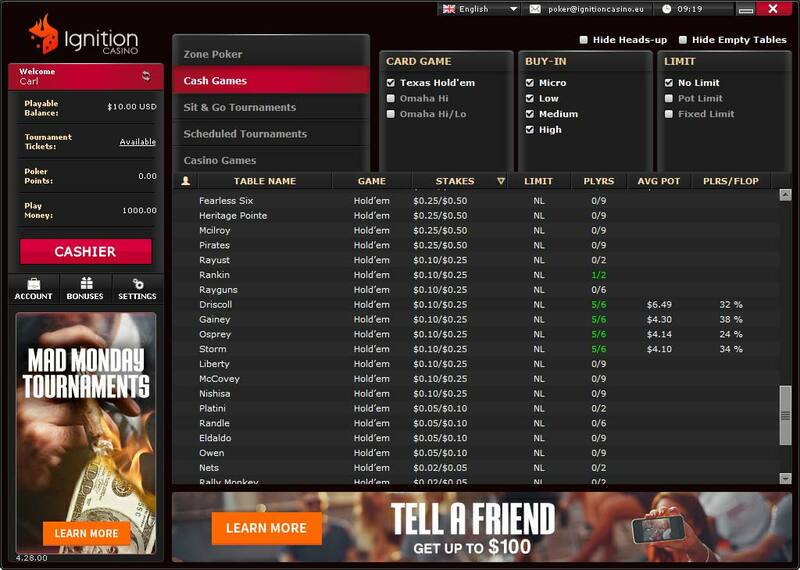 You can play only one table at a time with Ignition Poker’s mobile platform. Customer support is available 24/7/365 by calling 1-855-370-0600. You can also enter a message using a webform, and support personnel will send you an email, or email them directly at service@ignitioncasino.eu. The fishy player pool, Omaha action and speedy payouts set it apart from competitors. Beware the fees for deposits and withdrawals however: Your best bet it to conduct all your banking using Bitcoin to avoid these surcharges.